When I emerged from the Burrow this morning, I was surprised to discover it was sunny. Not peeking out from between clouds. Not trying to burn through the haze. But actual blue sky and glowing orb sunny. People looked happy and, frankly, kind of dazed. It’s been that kind of week down here. 1. When stopping in at one of the local shops for some bread, I find a bag of sour jelly pumpkins. They are coated in sugar, which is a good thing, because they make my eyes water with how sour they are. Neither Rudi nor I can pass the bag without snagging one. 2. Forced to leave the office, but not quite early enough to catch a yoga class, I instead head to a nearby nail salon and get a pedicure. I have to look through every bottle in the shop, but at last find the color I want — my favorite shade of purple. 3. Rudi and I head to Georgetown for a date. We dine out on the patio of a French restaurant we’ve been meaning to try for years. We explore the newly finished waterfront park, complete with fountain you can play in (the other half of the park opened more than a year ago). And we see Moneyball, which, to my great surprise, turns out to be an excellent film. It is not just for number nerds (my expectation), but also for lovers of the game and fans of a good story. I’m way behind on my book reviews, but figured I’d start off with the one I just finished. Still to come are reviews of The Woman in White, Diamond Ruby, Miss Peregrine’s Home for Peculiar Children, 13 Little Blue Envelopes, and Ninth Ward. My take: Commander Adam Dalgliesh has been named to head up a special division at Scotland Yard — one that investigates serious crimes that needed to be handled delicately, such as those of a political nature. Chief Inspector John Massingham and Inspector Kate Miskin round out the higher echelon of the team. Called to a Paddington church to investigate the deaths of a homeless man and a baronet, the team finds their first case seems to offer the initial and obvious answer that the rich man murdered the poor one and then killed himself with his own straight razor. However, the case seems to be a little too pat for Dalgliesh, who had a passing acquaintance with Sir Paul Berowne. With underlings in tow, they investigate everyone remotely involved with the man, from his beautiful wife (who is carrying on with an obstetrician) to his estranged daughter (who is dating a known Marxist) to his haughty mother to his local party officials. Following up on two other deaths loosely tied to Berowne convince Dalgliesh that he is correct that a murderer is on the loose. But with everyone trying to hide something, will he be able to find the guilty party in time? I picked this up at a library book sale, part of their “fill a bag” day. If I’d had to pay for it, I might not have picked it up. And, frankly, that might not have been a bad thing. I like cozies. I like police procedurals that are light on grisly crime and heavy on keeping peace among quirky characters. I prefer mysteries that are light and read quickly and that offer me a happy ending. I am happy to work to figure out the whodunnit, and even happier if the author has outwitted me at the reveal (provided that I can see where I should have sussed out the criminal). And I want my books to have plot lines that are wrapped up at the end of the novel and not left dangling, leaving you to wonder if the author bothered to re-read her text before sending it in and whether the decline in editing you’ve noticed recently could possibly date back as far as 1986 to when this novel was published. It took me a month to wallow through the description and elevated language of this novel, and I sympathized greatly with the detectives, who were busy sorting through a lot of useless details in search of the actual narrative of a man’s final weeks. Some characters (particularly a romance novelist constituent of Berowne’s) are well developed, but far too many others (such as Lady Berowne) are only lightly adapted sketches of common archetypes. I don’t know whether this work is indicative of James’ abilities in general or her Dalgliesh series in specific or an anomaly in an otherwise stellar career. However, it definitely has left me disinterested in finding out more, and that would seem to be a flaw in any mystery series. It’s the Thursday before the National Book Festival. Only two more sleeps! Why, no, I’m not excited at all. Why do you ask? 1. Four fat pumpkins adorn the front steps of a nearby townhouse. 2. The project I am in charge of at work is rapidly coming due. I suggest an aggressive (and somewhat painful) timeline to the members of my team this week, and no one disagrees or says it can’t be done or complains in the least. And, as of tonight, it looks like we’re on target to meet our goals for this week. 3. I spend the afternoon at the teahouse. I sip chai and snack on naan and chutney and read my mystery novel. 4. [It’s good to break the rules sometimes…] Because I am home alone, there is no one to suggest that I ought not to bake a batch of oatmeal scotchies at midnight. The batch comes out of the oven crispy and slightly caramelized — perfect for eating with tea. Sometimes, when life is really full of details, it can help to partake in a leisure-time activity that calls for very few. This is not the time for delicate yarns that slip or catch and tiny needles and complicated patterning. Yesterday I pulled out this fantastic skein of bulky-weight yarn from Folktale Yarn (purchased last fall at Crafty Bastards) and cast on for a new hat. That’s it. I didn’t bother to wind the yarn. 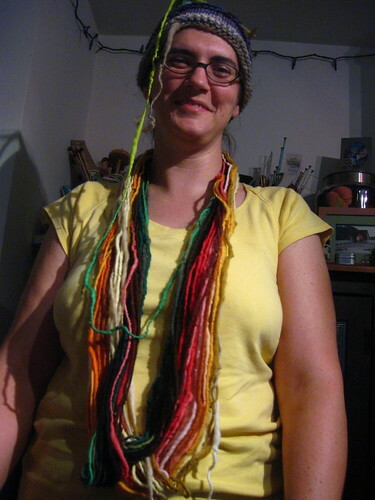 I decided instead to wear it as a necklace while knitting. When I finish knitting each night, I twist it back up into a hank and tuck the whole thing away (because a silver cat also thinks the yarn is quite fetching). I suspect the whole thing will be done tomorrow. 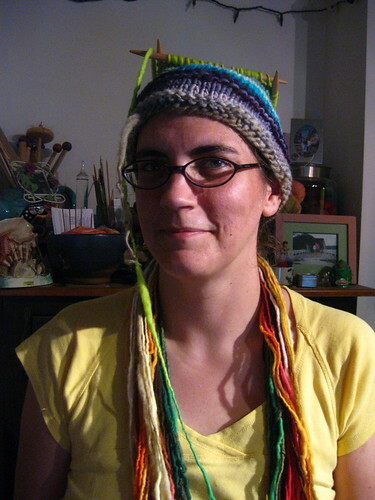 My yarn as jewelry motif will be over, but I think I’ll have a cute toque to show off. A little garter stitch, a little stockinette. 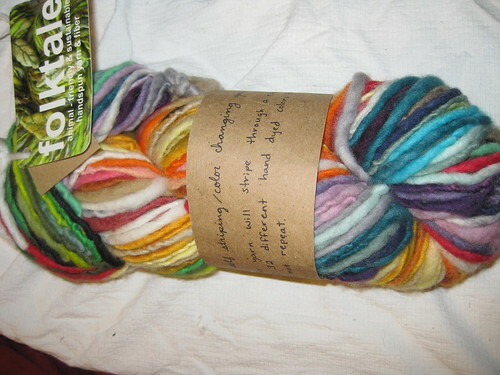 The yarn changes color on its own. Huge, gahonking needles. Simple. Relaxing. Low pressure. Seems like just what the doctor ordered. Today, my college roomie sent me a link to the new Three Musketeers — movie opening next month, and I thought it looked interesting. The Muppets — Nuff said. Hugo — The Scorsese adaptation of The Invention of Hugo Cabret, which I really liked. Arthur Christmas — A holiday movie from the creators of Wallace & Gromit. We Bought a Zoo — I wanted to read this memoir when it first came out, but I haven’t yet gotten around to it. Sherlock Holmes — A Game of Shadows — I really liked the first movie and am hopeful for more of the same in its sequel. There are a lot of other movies coming out between now and the end of the year that look intriguing. Which ones are you excited about seeing? Category: arts. There is/are Comments Off on five fall movies. I spent several hours down at the garden today, digging up fungi that had invaded from the wood chip mulch the garden uses to cover the pathways, weeding, planting some greens for the fall, and harvesting several pounds of produce (including a squash, a few more beans, and my very first cucumber ever). 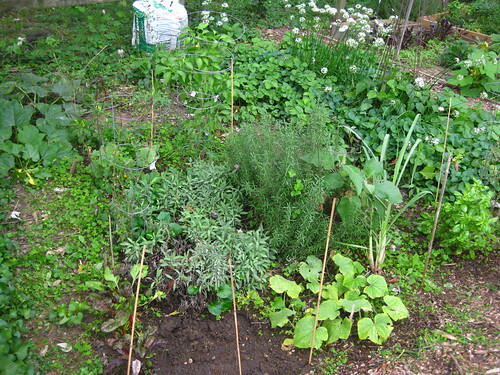 Category: garden. There is/are 4 Comments.